Many of these floor wax applicators are designed to be used with washable or disposable sleeves that trap and pick up dirt. We offer both applicators and cleaning sleeves, several of which can be washed many times to reduce replacement costs. You can also choose a larger floor wax applicator capable of applying water, finishes, sealers, urethanes, restorers, and disinfectants quickly and easily. Also make sure to check out other great items from 3M, Carlisle, Continental, Rubbermaid and Unger. Floor finishers and applicators are an economical and time-saving alternative to conventional finishing methods and the trouble that often accompanies them. These items are perfect for floors in offices, gyms, schools, and healthcare facilities and will quickly and efficiently apply wax or trap dirt. 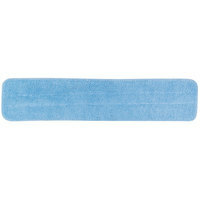 We also offer fabric or velour replacement pads to meet all of your cleaning needs. For related products, check out our housekeeping carts, janitor caddies, and floor care chemicals. If you're wondering where to buy carlisle floor finishers / applicators, we have a large selection of carlisle floor finishers / applicators for sale at the lowest prices.